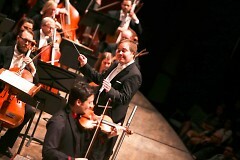 Marcelo Lehninger's debut with the Grand Rapids Symphony as Music Director included several standing ovations, the first after the opening movement of Tchaikovsky's Violin Concerto with Philippe Quint. It was that kind of night. Great Eras Series: The Romantic Concert with Brahms’ Tragic Overture and Haydn Variations as well as Schumann’s only piano concerto in St. Cecilia Music Center on Jan. 6. Highlights of the evening concert will be performed in the morning Jan. 6 for the GRS Coffee Classics Series. “Mozart, Mahler & Marcelo” with pianist Andrew von Oeyen and Mozart’s Piano Concerto No. 17 plus Mahler’s Symphony No. 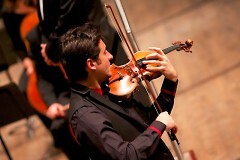 5 on Feb. 3-4 in DeVos Hall. “Pictures at an Exhibition” with the popular work by Mussorgsky plus Samuel Barber’s Adagio for Strings, John Corigliano’s Promenade Overture, and Erich Korngold’s Violin Concerto, featuring violinist Stefan Jackiw, on March 3-4 in DeVos Hall. A new era begins for the Grand Rapids Symphony. Marcelo Lehninger, the new Music Director of the Grand Rapids Symphony, ascended the podium in DeVos Performance Hall for the first time to lead his orchestra. He descended to enthusiastic applause and a standing ovation. Not once, but twice. That’s not entirely a surprise. After all, it’s been 17 years since DeVos Hall saw the first appearance of a new Grand Rapids Symphony Music Director. In fact, the audience roared its approval when Lehninger stepped on stage together with GRS President Peter Kjome to greet the opening-night audience on Friday, October 28. “I’m honored to be here,” Lehninger said, who was unveiled as the 14th music director of the Grand Rapids Symphony in June. Friday’s debut was equal to the occasion with a stunningly beautiful Rachmaninoff Symphony No. 2, not to mention a performance of Tchaikovsky’s Violin Concerto so exciting, the audience erupted in a standing ovation – after the first movement. It was that kind of night for the concert in the Richard and Helen DeVos Classical Series that repeated on Saturday, October 29. 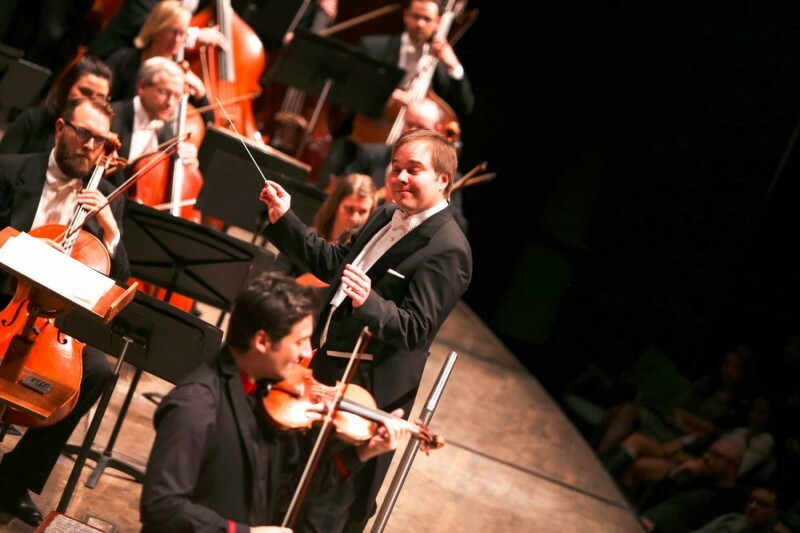 Friday’s audience of 1,426 couldn’t have asked for a better introduction to the 37-year-old conductor. If you don’t like Tchaikovsky or Rachmaninoff, there probably isn’t much an orchestra can do for you. On the other hand, with Tchaikovsky’s Violin Concerto and Rachmaninoff’s Symphony No. 2, a first-time concert goer easily can grasp the wonderful melodies and virtuosic pyrotechnics and be swept up by both. The experienced concert goer, in turn, could see the possibilities yet to come. The Brazilian-born conductor, soft spoken and gracious in person, has fire in his belly and a magic wand in his hand. Fresh from a concert tour “down under,” where he conducted the Rachmaninoff in the famed Sydney Opera House, Lehninger brought the work of hope and redemption along for his first performance as Music Director of the Grand Rapids Symphony. Rachmaninoff’s Second Symphony is a big piece and a long one. Lehninger led a performance of monumental proportions to match, drawing a big, full, lush sound from the ensemble of 86 musicians. Both the drama of the second-movement allegro molto and the beauty of the adagio in the third movement – featuring an exquisite clarinet solo by Suzanna Bratton – were given their due. Conducting with a minimum of gestures at times, at other times with a full-body approach, Lehninger got a good grip on the Grand Rapids Symphony and led it down the road less travelled. Clarity and more clarity were the order of the day with finely polished phrases and precise accents. Taking great pains to bring forward subtleties sometimes overlooked, Lehninger seemed determined to leave no musical stone unturned on this voyage of discovery. The former assistant and associate conductor of the Boston Symphony Orchestra for five years has ventured the opinion that every concert should be special. Out of the gate, he made good on that promise. 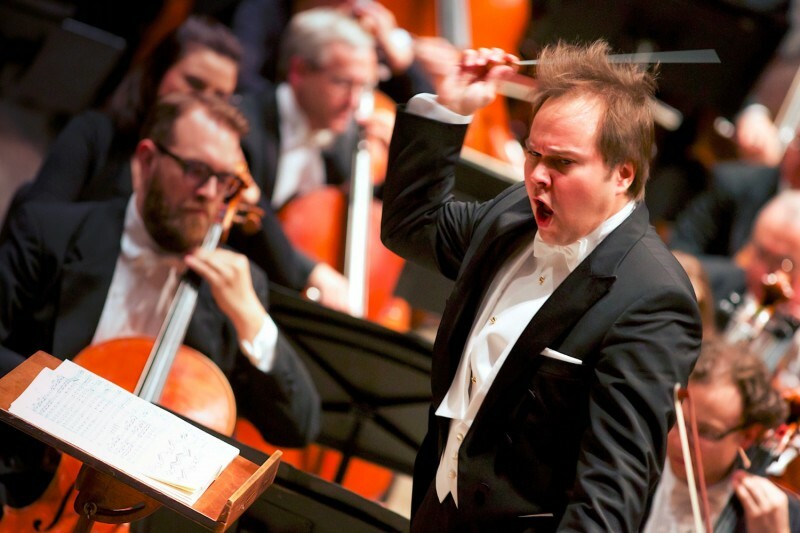 By coincidence, Quint was soloist when Lehninger made his DeVos Performance Hall debut in February 2015, leading the orchestra in Dvorak’s Symphony No. 9 From the New World. His 208-year-old Stradivarius violin has a gorgeous tone. His technique is masterful. He breaks plenty of hairs on his bow. When Quint plays a cadenza, he entertains as well. What’s more, he plays as a troubadour, spinning a story full of pathos and passion that has his audience hanging on his every word. Quint had the wind at his back with one of the most popular concertos in the repertoire. But the Russian-born violinist took it up another notch with a fresh, original sound that had you wondering what color rabbit he’d pull out of his hat and then left you satisfied with the result. Lehninger ran a tight ship with the Grand Rapids Symphony, conducting with a suitable blend of nimbleness and power that captivated in equal measure. Lehninger doesn’t return until January. He’ll be town three times over the following three months, first in St. Cecilia Music Center in January for the GRS Great Eras Series, followed by concerts in DeVos Hall in February and March. The four-year long search to find a successor to Music Director Laureate David Lockington is now truly over. A new era in the Grand Rapids Symphony’s history begins.